We get many email letters from our Join the Band parents. Everyday we go to work knowing that we can make a difference in our student’s lives. Hearing this back from parents helps us continue to with our mission to make a substantial difference in peoples lives through the power of music. This thank you note is long overdue, but the passage of time makes it no less heartfelt or full of admiration and appreciation. 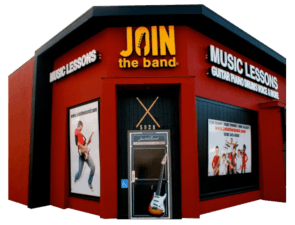 Join the Band is a remarkable music school for children and adults who love and or simply want to try music and be part of a band. My girlfriend insisted that I send my seven-year-old, music-obsessed son to you all, and I am so glad that I did! You provide an environment that is both nurturing and structured, and you lead by example. You and all of your band leaders were always on time, came prepared, encouraged the bands to work together as a team, to listen when others spoke, to work through conflicts and egos, and to learn the importance of practice so that you don’t let yourself or your bandmates down. You also insist that children learn to read music and protect their ears. In doing all of this, our son learned not just music skills, but very important life skills and good habits! Somehow when you interview each child before you place them in a band, you know just what will work and occasionally when there is some tweaking needed, you also handle that with such kindness and skill. You always listened and made us feel like you valued our child and sought to do what was best by him. You and your other well chosen band leaders never said no to a song idea (original or not) a new instrument, or a musical style. You always found a way to encourage what the band agreed upon and yet you managed to make sure that they were always growing, stretching, and improving with each new set. Unlike some music schools that lock each young musician into a specific instrument or won’t allow them to play multiple instruments let alone play and sing etc., Join the Band encourages the children to challenge themselves and celebrates their interest in learning new musical instruments as well as singing and playing instruments at the same time! We loved that you never pigeonholed or limited our son so his imagination was allowed to blossom and freely explore different styles of music, various instruments and ways of performing; from seated in a folksy sort of unplugged setting to rocking out! It was so exciting for our son to perform at such incredible music venues as The Roxy, The Whisky A Go Go, The Mint, and so many other renowned spaces! And because the children performed on a regular basis, the fear of performing became familiar, less scary, and each performance was an opportunity to grow and try new things instead of a one-time opportunity with excessive pressure. When our son was a freshman in high school, his guitar teacher asked me if my son could replace him in a gig since the teacher had another offer that would pay him more. It was for a large wedding sales event. When we showed up to meet the man who was hiring my son, he was a bit put off by seeing a 14-year-old, but by the end of their meeting, it was a different story. He gave my son a list of over 24 songs he needed to know by the next Saturday, many of which my son already knew thanks Join the Band. When we arrived at the event, it became clear that there was a problem. They had equipment that they did not know how to set up and hundreds of paying attendees were waiting. I asked my son if he would quietly go look at the situation. He did and explained to me that he could get everything working, but that he would need to unplug everything, relocate some things, and then connect it all properly. I asked him was he sure that he knew how to do this and he replied that of course he did, he had learned at Join the Band. I honestly don’t know what they would’ve done had my son not been there and been able to do exactly what he said he would, thanks to Join the Band. There is no limit to what young musicians can learn at Join the Band, if they put their minds to it. By the time our son’s school demands moved him on from Join the Band, heartbreaking for both of his parents, he was not only in one band each session but two, and a mentor in a third band. Mentoring a band was an incredible and meaningful opportunity that I believe will serve him for life. At one point when my son was still quite young, JTB had a flyer up for an incredible blues musician, John Marx. He was teaching an adult class, but you gave me his number so that I could speak with him about giving my son a blues lesson. That lesson with the incredible John Marx changed my son’s life. It was profound on so many levels, and this was only possible thanks to Join the Band. Mr. Marx even agreed to lead a kids Blues band! Ryan, another one of your talented and terrific bandleaders, was also such an important part of our son’s musical growth and journey, as both a musician and singer/songwriter. Anyone who works with Ryan will be beyond lucky! You all nurtured our son and helped guide us as parents, and we will be forever grateful. I want to add something important. The point of this is not to boast, but I’d be remiss if I did not say that Join the Band made my son’s college auditions as stress-free as that sort of situation could be. Not only did he get accepted into every college that he applied to, but he is a music major, and he received generous scholarship offers from each college. Yes, he was a good student with exceptional test scores and extracurriculars, but we firmly believe that the music school opportunities were greatly enhanced because of his time spent at Join the Band. On a scale of 1 to 10, we would give Join the Band a 20!! !